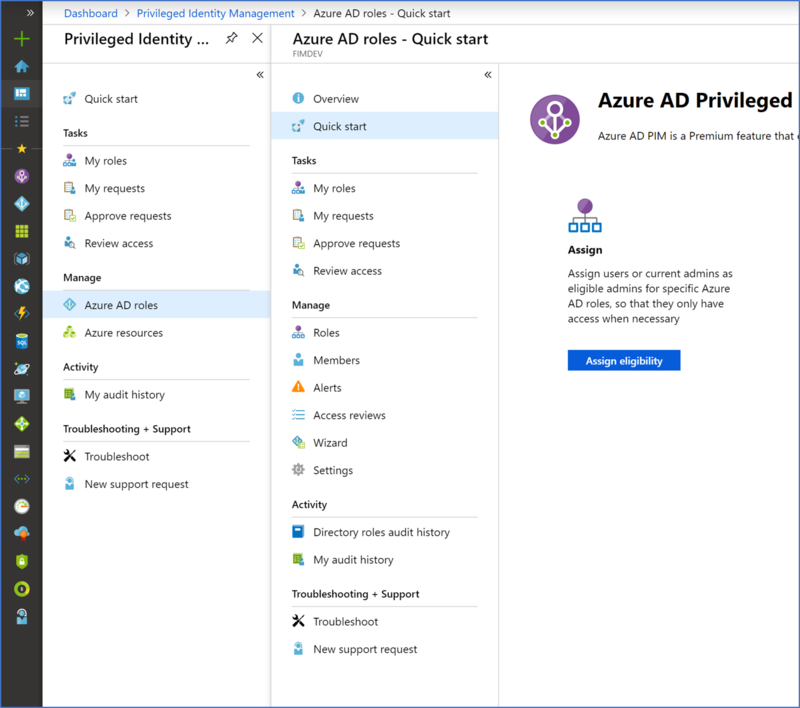 Azure Active Directory (Azure AD) Privileged Identity Management (PIM) is a service that enables you to manage, control, and monitor access to important resources in your organization. This includes access to resources in Azure AD, Azure resources, and other Microsoft Online Services like Office 365 or Microsoft Intune. Why should I use PIM? Organizations want to minimize the number of people who have access to secure information or resources, because that reduces the chance of a malicious actor getting that access, or an authorized user inadvertently impacting a sensitive resource. However, users still need to carry out privileged operations in Azure AD, Azure, Office 365, or SaaS apps. Organizations can give users just-in-time (JIT) privileged access to Azure resources and Azure AD. There is a need for oversight for what those users are doing with their administrator privileges. PIM helps to mitigate the risk of excessive, unnecessary, or misused access rights. What can I do with PIM? To use PIM, you must have one of the following paid or trial licenses. For more information, see What is Azure Active Directory?. For information about licenses for users, see License requirements to use PIM. To better understand PIM and its documentation, you should review the following terms. eligible Type A role assignment that requires a user to perform one or more actions to use the role. If a user has been made eligible for a role, that means they can activate the role when they need to perform privileged tasks. There's no difference in the access given to someone with a permanent versus an eligible role assignment. The only difference is that some people don't need that access all the time. active Type A role assignment that doesn't require a user to perform any action to use the role. Users assigned as active have the privileges assigned to the role. assigned State A user that has an active role assignment. activated State A user that has an eligible role assignment, performed the actions to activate the role, and is now active. Once activated, the user can use the role for a preconfigured period-of-time before they need to activate again. permanent eligible Duration A role assignment where a user is always eligible to activate the role. permanent active Duration A role assignment where a user can always use the role without performing any actions. expire eligible Duration A role assignment where a user is eligible to activate the role within a specified start and end date. expire active Duration A role assignment where a user can use the role without performing any actions within a specified start and end date. What does PIM look like? Once you set up PIM, you'll see Tasks, Manage, and Activity options in the left navigation menu. As an administrator, you'll choose between managing Azure AD roles and Azure resource roles. When you choose the type of roles to manage, you see a similar set of options for that role type. Who can do what in PIM? If you're the first person to use PIM, you are automatically assigned the Security Administrator and Privileged Role Administrator roles in the directory. For Azure AD roles, only a user who is in the Privileged Role Administrator role can manage assignments for other administrators in PIM. You can grant access to other administrators to manage PIM. Global Administrators, Security Administrators, and Security Readers can view assignments to Azure AD roles in PIM. For Azure resource roles, only a subscription administrator, a resource Owner, or a resource User Access Administrator can manage assignments for other administrators in PIM. Users who are Privileged Role Administrators, Security Administrators, or Security Readers do not by default have access to view assignments to Azure resource roles in PIM.